This Congressman's Son Wishes HE Got A Free Trip Back To Mexico! This Congressman’s Son Wishes HE Got A Free Trip Back To Mexico! 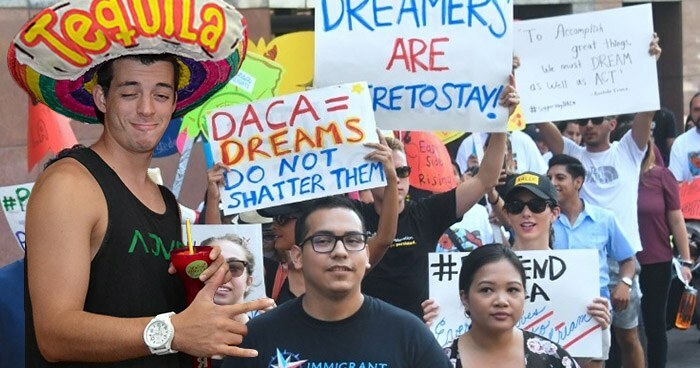 Attorney General Jeff Sessions announced Tuesday that the Trump administration would follow through on plans to repeal DACA, an Obama-era policy that protects undocumented children who were brought into the U.S. by their families, from the threat of deportation. Many have called this decision cruel, considering that a vast number of children have never experienced life anywhere outside the United States. Bo Kirby, son of a prominent U.S. Congressman, takes a different view. Though the young Kirby has yet to pay taxes (he’s finishing up his sixth year as an undergrad at Texas Christian University), he feels strongly that it’s natural born citizens who are on the true losing end of this deal. While Kirby admits he has yet to actually hold a job, he also shares the concerns of some Americans that DACA beneficiaries are taking employment opportunities from natural born citizens. “Why should Jose be allowed to stay here and work some job that I’m perfectly qualified for?,” questioned Kirby, who will work a part-time internship at his uncle’s law firm this fall. As for the three-quarters of a million undocumented youth shielded by DACA, Kirby says he’ll see them the next time he’s in Mexico.